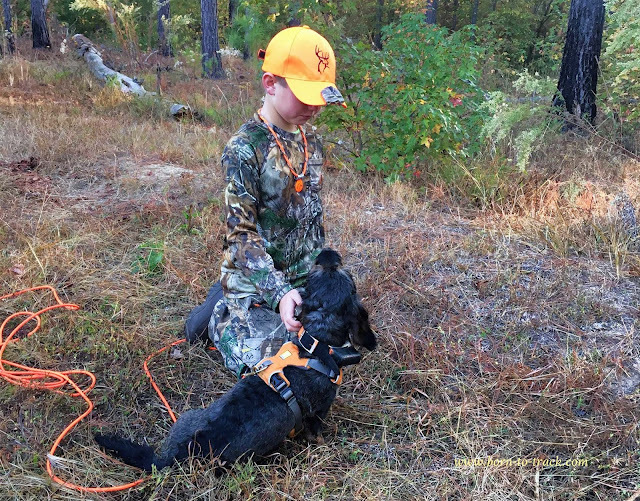 Tracking dogs for finding wounded big game. 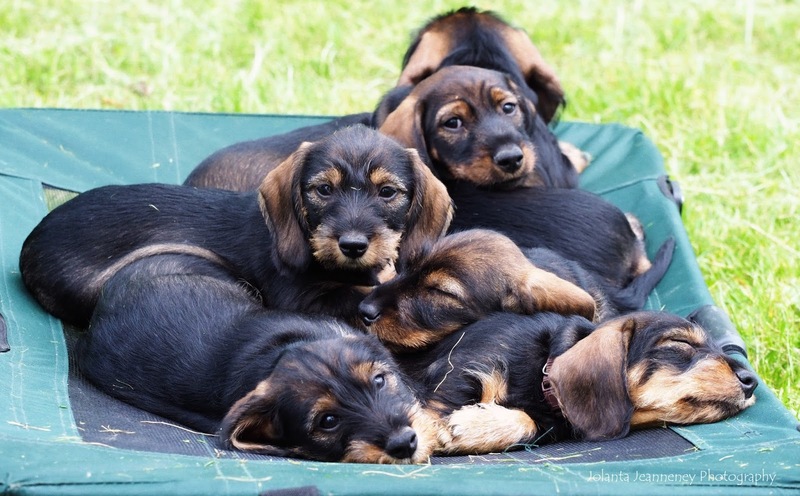 Also dachshunds for blood tracking, field trials, their breeding, training and more. I hope that you are going to enjoy the calendar as much as I did while I was working on it. 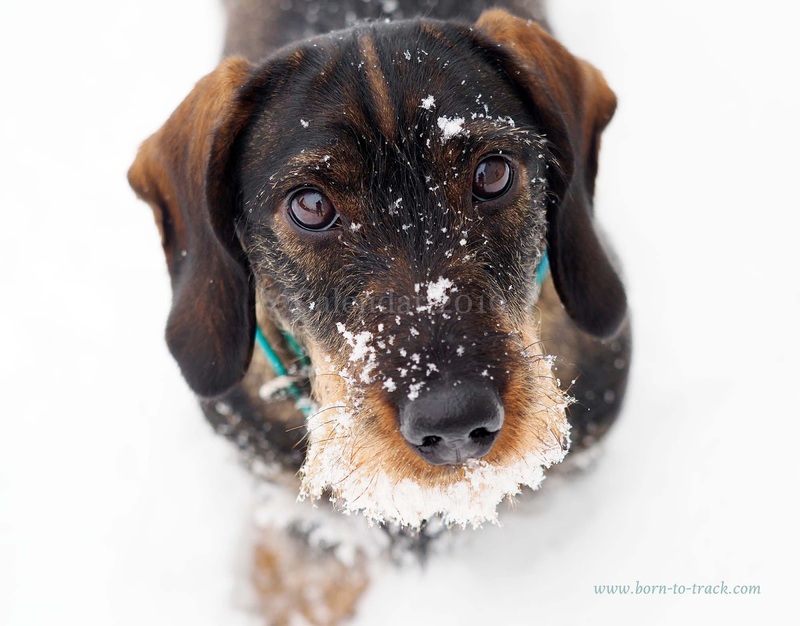 I have done calendars with wirehaired dachshunds in 2013-16. Last year I ran out of time, and I know that I left some people disappointed. I am trying to redeem myself this winter. The calendar is available through cafepress: click here. It is "printed on demand" - you order it from them, they print it and ship it to you directly while I get a small commission. I have been asked to identify dogs in the pictures so here we go. We didn't have any puppies in 2018 so for puppy pictures I had to go back to 2017. The cover shows two pups out of Tommy and Tuesday, our A-litter. From the left: Andi von Moosbach-Zuzelek lives now with Jerry Gregston in Oklahoma. Artie von Moosbach-Zuzelek, called Enzo, is a tracking partner of Blair Smyth in Virginia. These pups were born on April 9, 2017. January picture, which is one of my all-time favorites, shows Bernie (FC Darin von Moosbach-Zuzelek), Kunox (FC Kunox von der Dohlmühle) and Mielikki (FC Mielikki Raptor). This picture was taken in February 2014, and when I look at it, it stirs my soul. 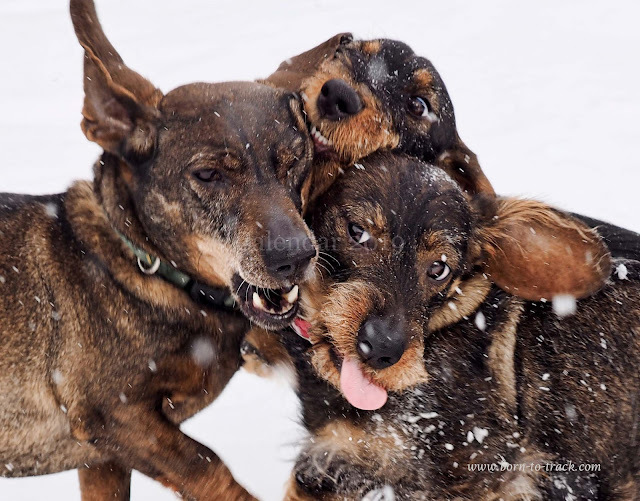 These were happy times, especially for these three dogs. Since then Bernie has passed (I miss him dearly), and Kunox and Mielikki are in their new homes (I miss them too). Being a breeder leaves you with a heavy heart on so many occasions. 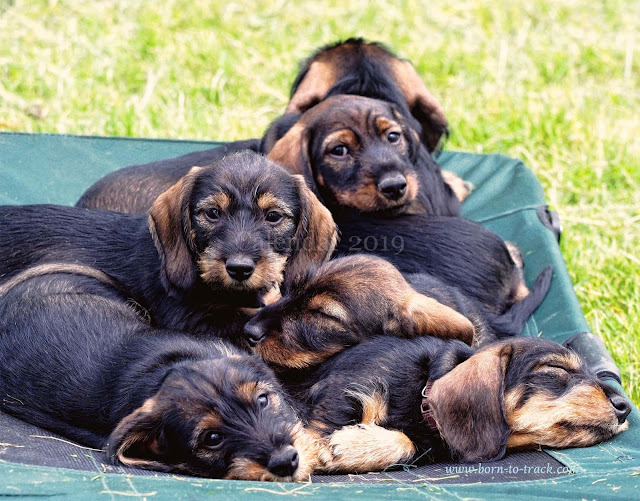 You have to make hard decisions - your heart screams "enjoy the dogs you have and don't add any new ones to the pack", but then you have to consider your future breeding plans. Often dogs who are retired from breeding (like Mielikki after 2 C-sections) are better off in a new home, where they are a part of a much smaller pack. Anyway, Mielikki enjoys very much her new life in Maine, and Kunox tracks for Rom Rausch in northern NY. Both decisions to rehome these dogs were heart breaking for me but very good for the dogs. February picture shows Willow (FC Willow von Moosbach-Zuzelek), a lovely daughter of Kunox and Tuesday. Willow was born on March 9, 2015, and we hope to breed her in 2019. She combines the best features of her two parents. March picture shows again Artie (Enzo) and Andi. April picture goes back several years. 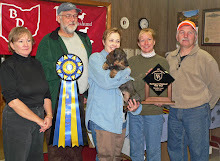 It is a very young Mossy Brooke (Viola von Moosbach-Zuzelek), a super tracking dog owned by Judy Catrett from Georgia. By now Mossy Brooke has recovered over 100 deer, and we are very proud of her. She is a daughter of Tommy and Tuesday, a full sister to Andi and Artie. For more on Mossy Brooke see the November picture. May picture is of Z-puppies, which were born on March 26, 2017. This litter was co-bred with Cheri Faust, who is an owner of the dam FC Uta von Moosbach-Zuzelek. Puppies were whelped and raised in Wisconsin, and then they came here for four weeks. Cheri kept two pups for herself, Zeus and Zenyatta, who became Field Champions quickly. Zale (Aldo), Zorro, Zack (Cooper) and Zander von Moosbach-Zuzelek are trackers of wounded game in Maine, Michigan, North Carolina and Virginia, respectively. BTW, Aldo (Zale von Moosbach-Zuzelek) owned by Lindsay Ware from Maine participated in 103 tracks and recovered 34 animals (6 bears and 28 deer)! June picture shows Odin von der Dohlmühle, who was born on August 9, 2017, and was bred by Annelie Grauer from Germany. 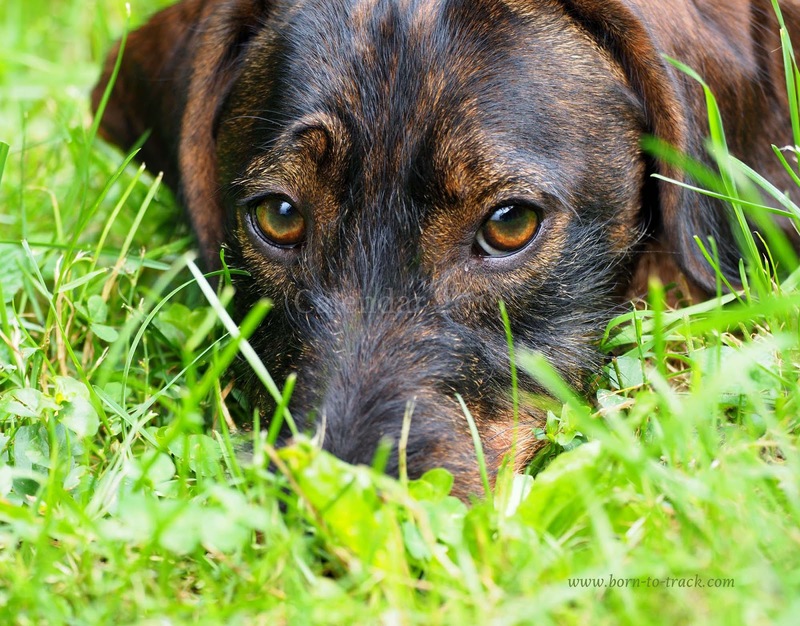 Odin is handsome, talented dog with a super nice head and soulful eyes. He always has his nose to the ground, and loves to track and hunt. 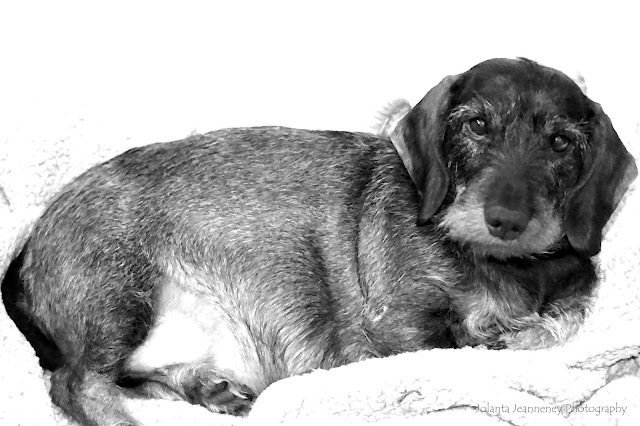 This is a picture of FC Keena von Moosbach-Zuzelek, who turned 13 years old on April 7, 2018. Keena used to be a tracking partner of our friend Dan until he moved to Texas this summer. She is doing OK in her old age, but her arthritis and heart problems have started to interfere a little bit with her quality of life. She is still full of piss and vinegar though! August picture shows FC Joeri vom Nonnenschlag, who is going to turn 11 this coming February. Joeri loves to swim and retrieve from our pond. Joeri and John are inseparable. He is a dog of many talents, with a lot of soul and heart. FC Tom vom Linteler-Forst is still our top tracking dog. He is going to turn 11 this coming March, but he is still very much a puppy - can be very playful and and just plain silly. This year Tommy was tracking for our friends. Actually anybody who sees him tracking says what an amazing dog he is. He turned out to be a great producer as well. Odette von der Dohlmühle, a sister of Odin, born August 9, 2017, is a small mischievous 16-lb female full of fire. This summer she showed how much she loves to swim and retrieve from the pond. She loves to track, go to the ground and chase rabbits while opening on them. 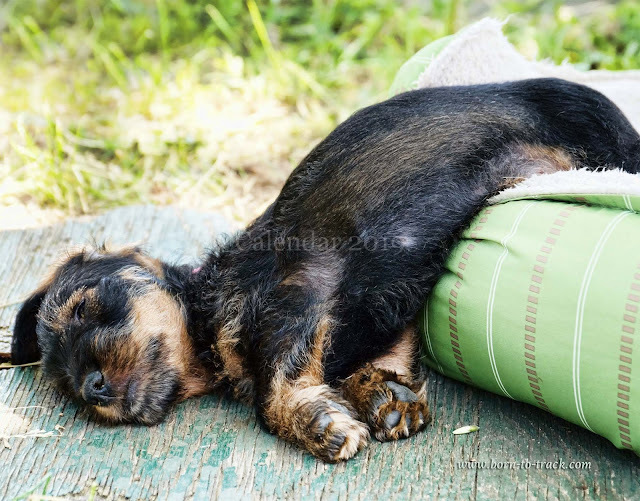 A truly versatile teckel. Jolanta, you ACED it when you chose Viola to be our puppy. If everything you have done in life has been this accurate, I would consider you to be most astute at your endeavors. I wanted a pup who could/would communicate with me. This little girl has graduated from Communication 200. When we track Mossy Brooke communicates to me that the deer is within 10-30 yards in front of us alive. This has proven to be one of her most helpful traits in our tracking. Gives us a quick moment to look for the deer and hopefully get a killing shot off. Mossy Brooke’s vocabulary continues to grow. She loves to lay next to me on my pillow after tracking and we talk about the tracks we have done that day. She whimpers, wags tail as I talk and then uses her front paw to remind me to keep talking if I stop. She eventually falls to sleep and before long, her little feet are running and she is quietly barking as I am sure she is dreaming about her days work. She dearly loves to track. Thanks again Jolanta and John for my little soul mate. 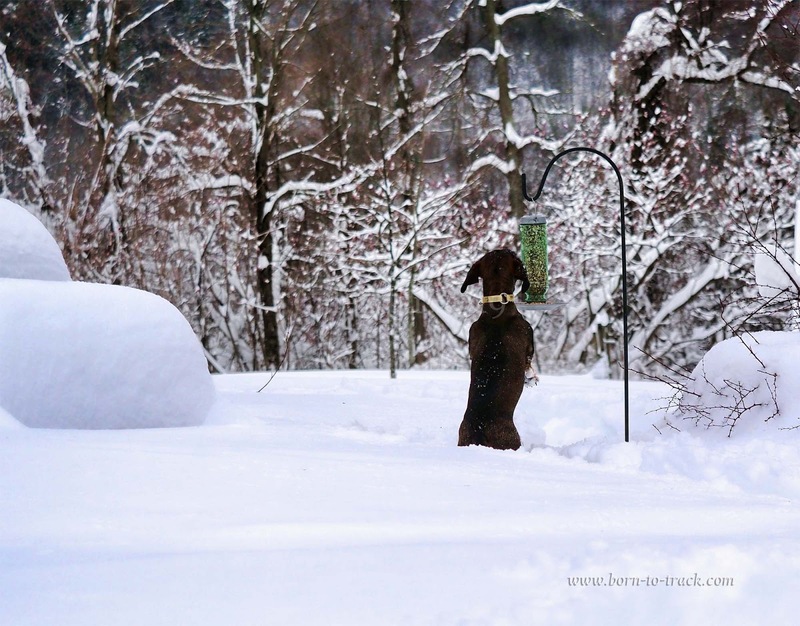 December picture was taken last winter and shows our inquisitive Xena von Moosbach-Zuzelek, who was born on July 26, 2015. 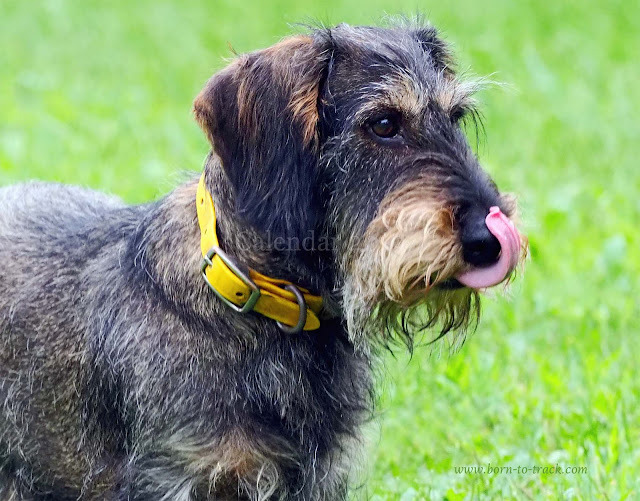 Xena is a daughter of Dachs von Tierspur (Billy's son) and FC Mielikki Raptor. She is a high energy hunting dog who never quits. We hope to breed her in 2019. We get a lot of questions about our breeding plans for 2019. Yes, we are going to have puppies. How many litters, we don't know yet. To help you plan we have created a sign-up form, where you can add your name and email so we can notify you once we make a decision. By adding your name to the list, you are guaranteed that you will receive email from us once we decide to have puppies. In no way it means that you are on our waiting list or that you will get a puppy. We screen all our buyers very carefully and it is a multi-step process that involves filling out a questionnaire and phone conversations. We sell puppies only to people who are serious about tracking and would like to track for other people, not just their family and friends. A tracking dog learns a lot on the job. He will never be developped to his full potential if he is used only 5 times a year. We do not ship puppies so you will have to come to Berne, NY (40 minutes from Albany, NY, which has an International Airport) to pick up your puppy when the pup is 10-12 weeks old. All our puppies come with the AKC limited registration. · The dog is of breeding quality. 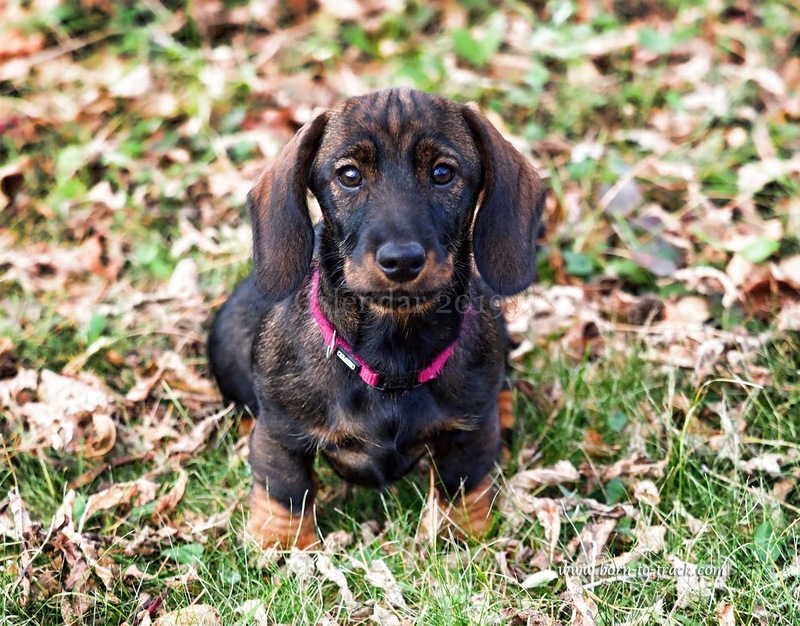 · The buyer has become sufficiently knowledgeable about the dachshund breed. · The buyer is dedicated to the responsible breeding of the dachshund as a hunting dog. Tuesday had two puppies in 2017, and they were born on April 9. Andi is owned by Jerry Gregston from Oklahoma and Artie is going to track for Blair Smyth from Virginia. FC Uta von Moosbach-Zuzelek, co-owned with Cheri Faust, whelped six puppies on March 26, 2017. They are Zeus, Zorro,, Zack, Zander, Zale and Zenyatta. 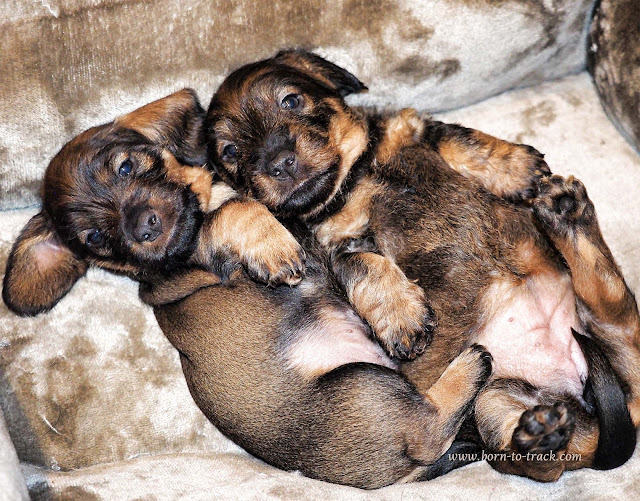 This litter we co-bred with Cheri, who decided to keep two puppies - Zeus and Zenyatta. 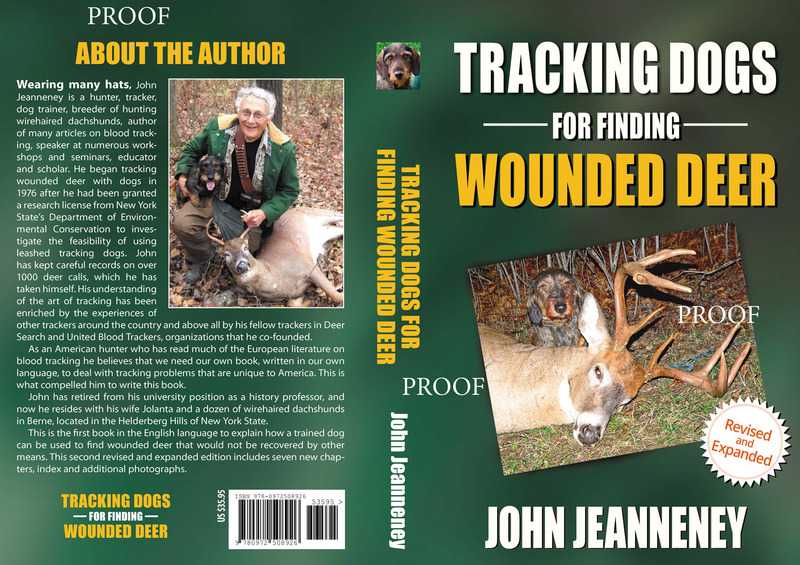 New, revised and expanded version of the 2nd edition of Tracking Dogs for Finding Wounded Deer can be ordered at http://www.born-to-track.com/book/order-info.htm. Best book about blood tracking dogs in English. A must-have book for hunters! Dead On! 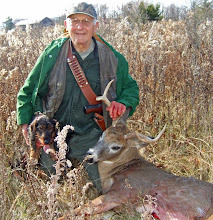 Deer Anatomy and Shot Placement for Bow and Gun Hunters. Tracking Techniques for Wounded Whitetails. For more info or to buy click on the cover. All material, unless otherwise stated is Copyright (c) by Jolanta and John Jeanneney. All rights reserved. No Reproduction Allowed Without Prior Permission. No one has paid for a listing or reference on this blog. 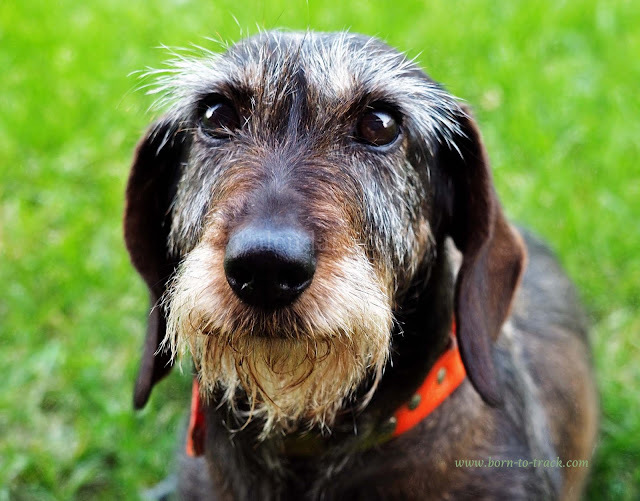 Do wirehaired dachshunds shed? How to groom them? 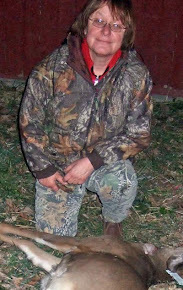 This is Joeri with the woodchuck he killed. 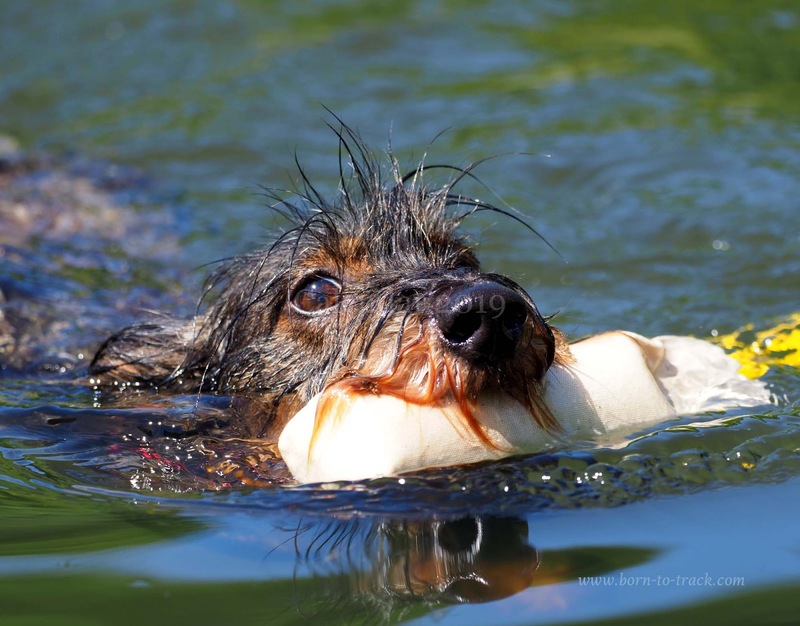 The dachshund is a very versatile hunting breed.